Cleans, conditions, and preserves your brushes. Works with oils, acrylics, watercolors, varnishes, and glazes. Will restore most hardened brushes to like-new condition. 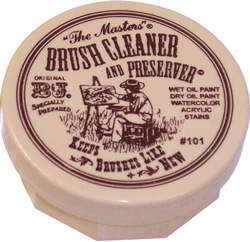 Helps prevent oil and acrylic build-up that causes brush hardening.